So here is the gameplan for the car. how do you plan on fixing the RR wheel? lolz... that's pocket change for a project car Kev. I have a part time job, but still not a lot of money. According to Mike at GST, you can put adjustable rear lateral links and that should be able to tweak the toe a little bit. Hopefully, I can find something. Last edited by darkonion; 08-10-2007 at 11:32 AM. Thanks. I got lots of help from a ton of people. Props to them. Went auto-x'ing today. Car ran really well. It felt really good. I think the raising of the front was really helpful. Hopefully will have some pictures soon. The event today went really well. With the new raised front, the car was definitely a little better. Even the drive down was a lot better. 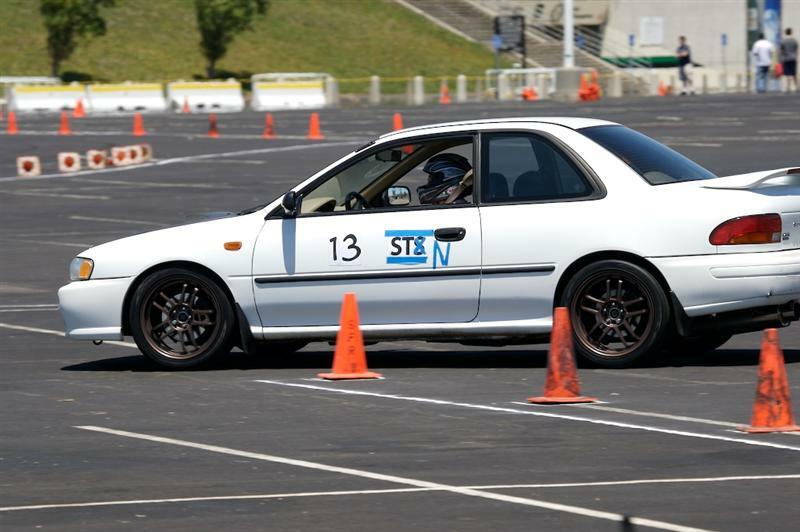 It is still a coilover set-up, so, it was still a bit stiff for the road, but as for the auto-x, it ran great. The rear was sliding out a little bit. Not much though. Still need to learn how to drive though. I think a little of it is that I am kind of afraid to let the rear slide out. All and all, it went well. The suspension really helped with slaloms. Good experience. I think I have to make better choices with when the car slides though. I guess it is nice that I am getting more comfortable with getting the tail out and sliding. It was a really fun course though. Last edited by darkonion; 08-20-2007 at 08:15 PM. Game plan for the car. I have kind of decided what I am going to do for my car. First thing first, I need to take care of that rear right wheel. So, my first order of business is to get those rear lateral links and alignment. $350ish for lateral links... eeks, but it has to be done. Once that's done, I am going to do brakes. If I can get some half decent WRX rotors and caliper brackets, I can get some decent pads and it'll be okay. I am more worried about the front than I am about the rear, but both of them really need to be changed. Until I take care of these things, I don't plan on doing a track day until then. I would really like to participate in one, but it is kind of unlikely right now. Right now, it is looking about $400-$500 on brakes and that's something that I can't really afford something so expensive right now. I think my brakes should last me for a little longer though. After those two things, I need to clearcoat my hood. It needs to be done. Charlie (Onizuka) offered to help me rebuff the hood. I am going to try that first, hopefully to save a few bucks until I am get it to the shop to have them reclear it. I am probably going to prep the hood myself and then bring it in to them. Wow, cant wait to see the final product of your ride kev..Oh btw, thanks for reccommending Henry C. I already contacted him and hopefully soon to hear back.. Cool. I don't think there will ever be any finish for my car. For some reason, I always find something new to do to it. Haha. One thing at a time right? I am looking for Whiteline KTA108's. Those are the rear front and rear rear lateral links. It is the same part number for the GC's as it is for the WRX wagons. I think they run about $350ish, but I've seen them as low as $320. There was this one place that was even selling them for $290. Yeah... hella expensive.